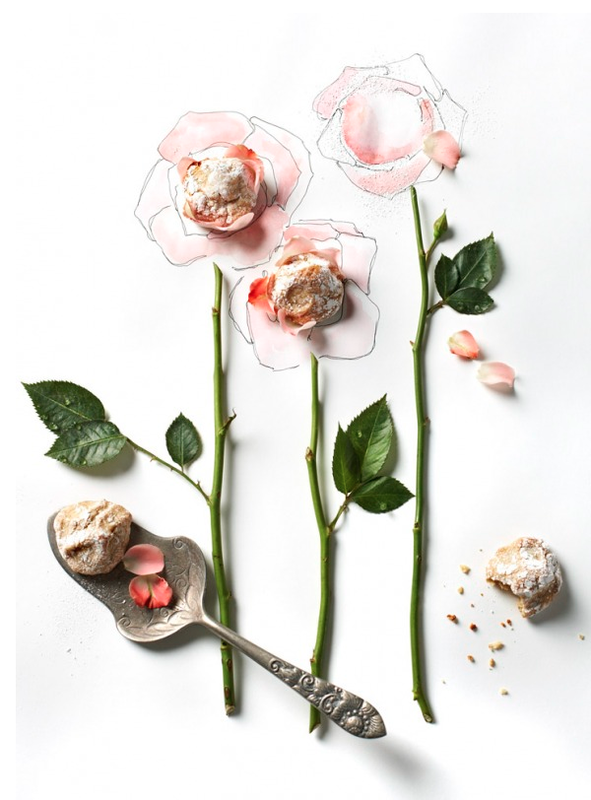 A Pop-Up Picnic ~ the secret Dinner in White is a refined flash-mob feast! 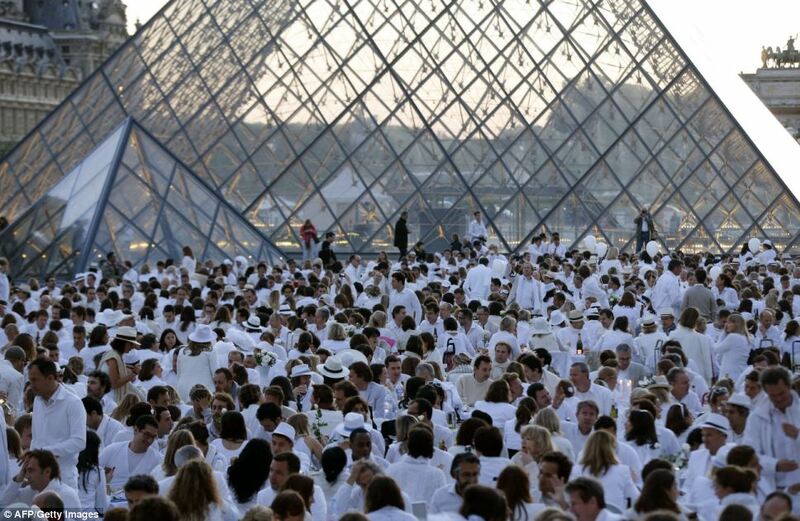 Launched with just a handful of friends in France, the ultimate picnic-chic dinner party celebrated the 25th year of the Diner en Blanc tradition at the Trocadéro and Louvre in Paris. Guests wear white and the venue is not revealed until the last minute. 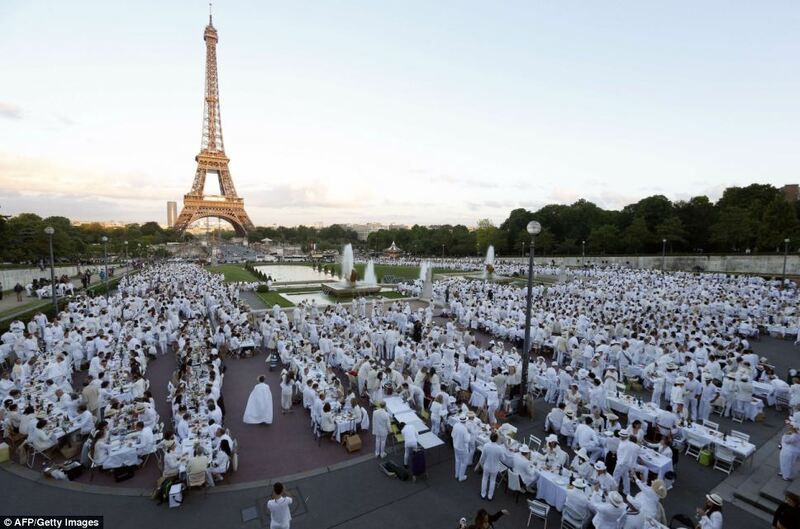 The Diner en Blanc tradition that has now spread worldwide. 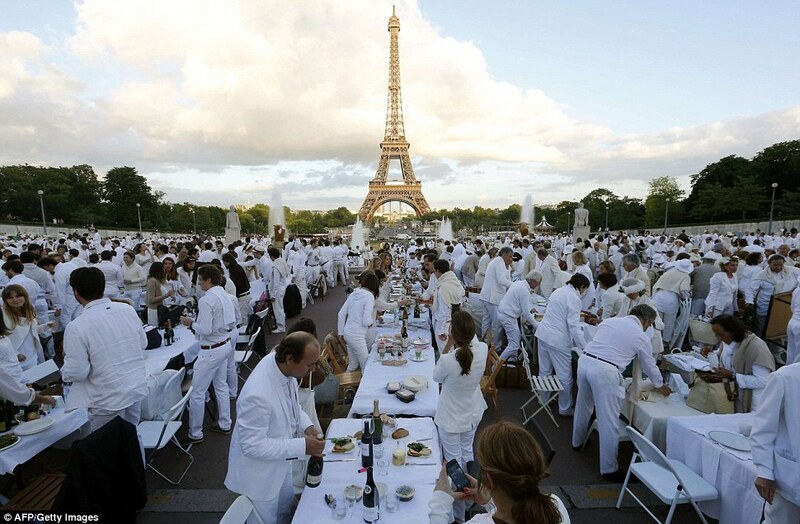 People, all dressed up head to toe in white, enjoy al fresco dining on china plates and bottles of champagne to toast Diner en Blanc’s birthday at the Trocadero square in front of the Eiffel Tower in Paris. Attendance is by invite only and guests are only told the illustrious location an hour before dinner starts. 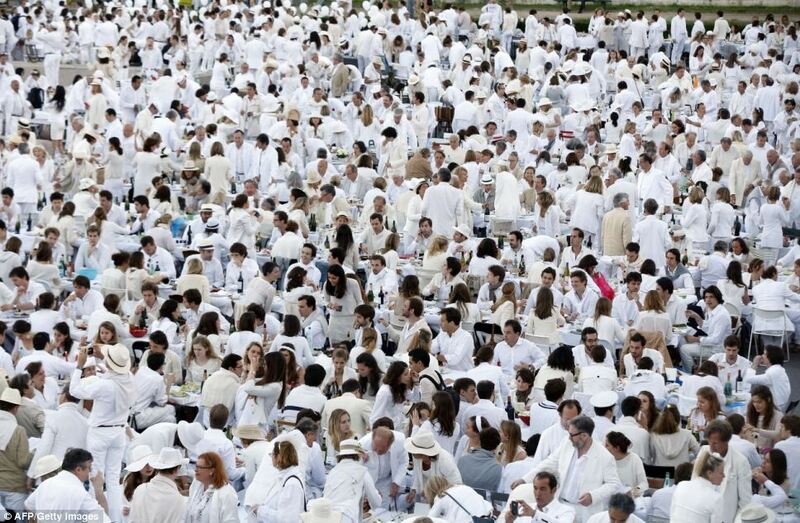 be dressed all in white with a picnic table, wine and food. Eat to the beat: A band entertains diners eating al fresco in the shadow of the Eiffel Tower. It’s a tradition going back a quarter of a century, but really not one where you want to spill the red wine. 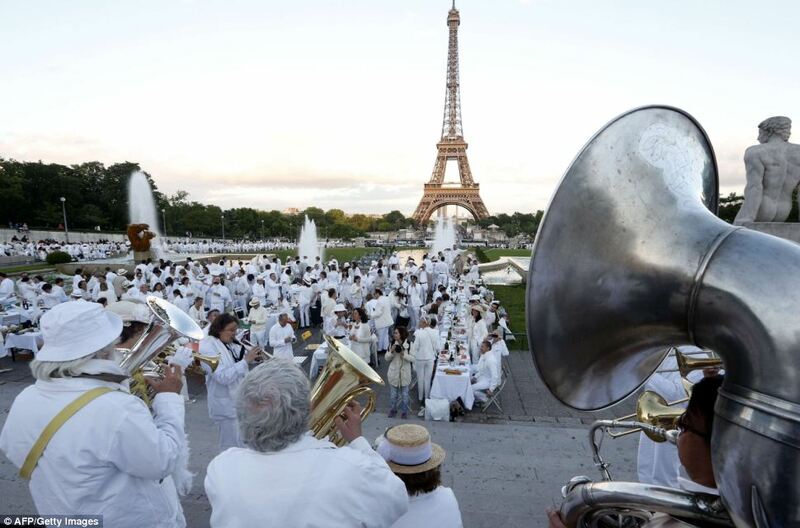 Thousands of foodies dressed from head to toe in sparkling white converged on Paris last night to quaff champagne and eat fine foods together as the annual Diner en Blanc celebrated its 25th birthday. 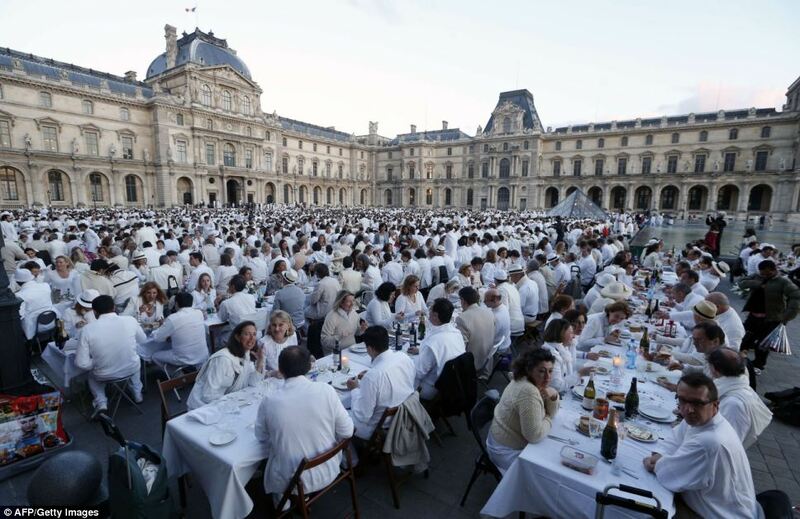 Diners, who had signed up for the event were kept in the dark as to the location of the giant dinner party right up until the last minute, but were told to make their way to either the Trocadéro or the grounds of the Louvre via email earlier in the evening. 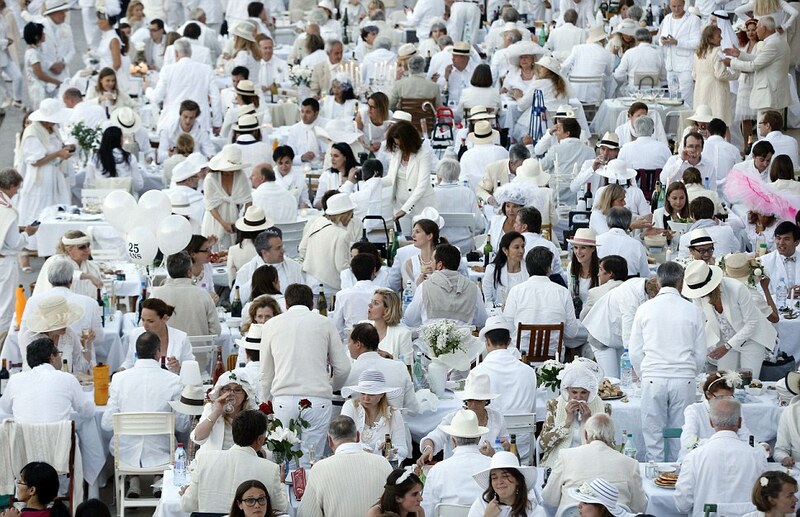 Within the hour, row upon row of picnic tables – complete with white table cloths – were set up, wine was uncorked and revellers began sharing food at the spectacular event. Guests enjoyed their dinner against the backdrop of the Eiffel Tower and the city’s most iconic museum until midnight, when they pack up their rubbish and leave. The tradition began in 1988 when a group of ten friends decided they wanted to eat at a forbidden spot in the French capital. They dined as a 200 strong flash mob at the Jardins de Bagatelle, a favourite spot of French royalty including Marie Antoinette. Since then the event has gone global with versions of the dinner taking place in European cities such as Milan and Barcelona and much further afield in more than a dozen locations in the US, Canada, Singapore and even Rwanda and the Ivory Coast. The craze finally made the short journey from its Paris home across the Channel to London only last September when thousands of diners converged on the South Piazza of Covent Garden. The Paris version remains the tradition’s definitive one. Each year the guest list exceeds 15,000 say organisers and past dinners have taken place at such illustrious settings as the Pont des Arts, the grounds of the Eiffel Tower, the Louvre and the Palace of Versailles. Guests at both venues would have either had to have attended the last Paris event or been invited by someone who did. Everyone who is invited must bring a guest and arrive by public transport. Guests must bring a picnic table, a picnic basket, foldable cheers and a table cloth – all in white of course. Men and women sit on opposite sides of the table to one another and guests are forbidden to sit down until their entire row have set up their table. No excuses: if you are invited, don’t let a double booking or inclement weather put you off – if you fail to turn up or don’t abide by the events rules then you won’t be invited back. Following in his François Pasquier’s footsteps, one of his sons, Aymeric Pasquier, moved to Montreal and kept the family tradition going when he came together with friends to hold the first Dîner en Blanc in August of 2009. 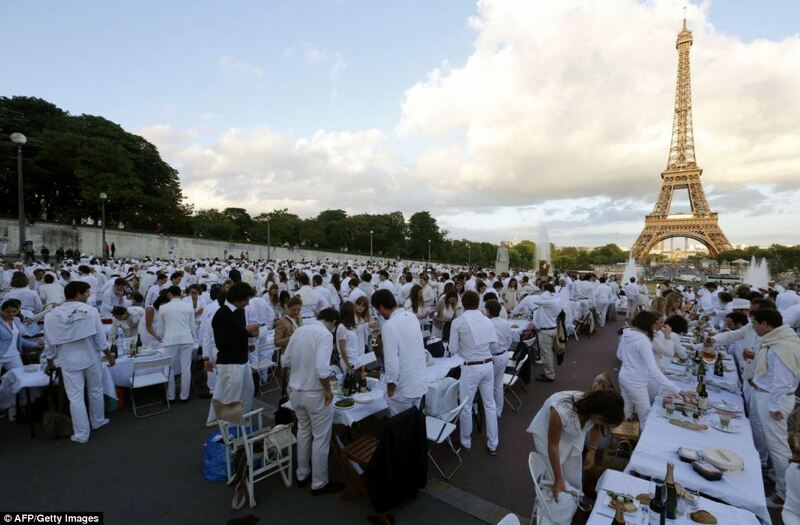 In 2011, Aymeric partnered-up with Sandy Safi to launch the first American Dîner en Blanc in New York. The United States held its first Dîner en Blanc in New York on August 25th, 2011. That evening, 1,200 diners (selected from over 30,000 hopefuls) celebrated outdoors at a yet-to-be-disclosed location amid live music and dancing, with festive white balloons and sparklers. Guests, dressed in elegant white, brought their own epicurean feasts, tables, chairs, glasses, silver and white napery. Aymeric Pasquier and Sandy Safi then came together to create Dîner en Bland International, a Dîner en Blanc organization that would promote the history and philosophy of this event through hosts worldwide, and create an international network of diners and Dîner en Blanc enthusiasts. 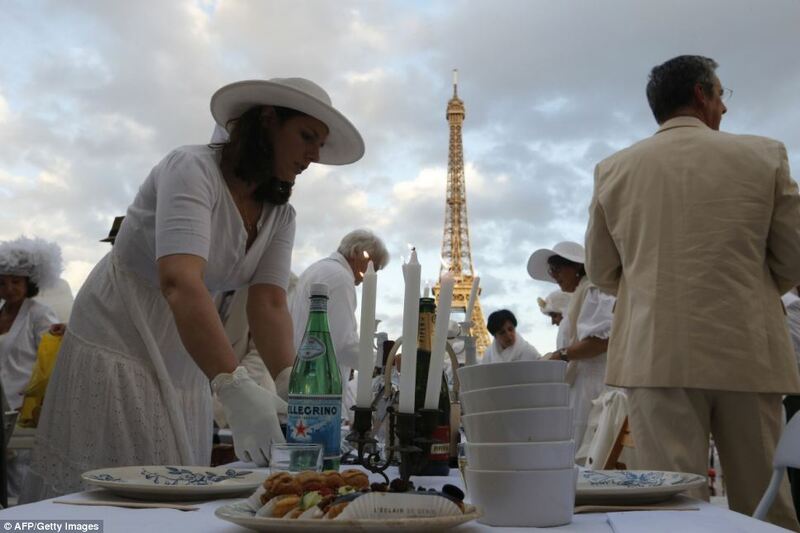 With over a dozen cities having joined the Dîner en Blanc family in 2012, what began (and remains in Paris) as a “friends and word-of-mouth only” event has grown into an international epicurean phenomenon across five continents. Pumpkin Soup with Chanterelles :: This recipe comes from Sweet Paul, the Fall issue’s My happy Dish winner Ewa Ostoja-Helczynska. Chop the garlic and shallots. Fry in a tablespoon of olive oil. Add the Pumpkin cut into large dice and cover with stock. Cook for about 20 min. Once the pumpkin is soft, add to a blander and whizz until smoothe. Pour back into the pot and add cream. Saute the chanterelles and thyme in the olive oil. Divide them in four bowls. Fill each bowl with hot soup. As Nicole at Herriott Grace says goodbye to long summer days, here in Australia we are saying hello! It was a hot ice-cream imbibing weekend! In clebration of the warm weather I am sharing Nikole’s Chocolate chip mint ice-cream with handmade cones with beautifully crafted cone rollers! In a medium bowl whisk together both types of sugar. Add the whites and whip until the mixture is frothy and ribbons begin to appear. Add the vanilla. Whisk in flour and salt and beat until well combined. Stir in the butter. Bake in a prepared and preheated waffle iron made especially for cones until golden. (As a general rule I bake 1 tablespoon of batter for 1 minute and 25 seconds on setting 5, but your machine may have different settings.) Repeat, greasing your iron as you go. Roll each waffle immediamtely after it comes off the machine (small cotton or latex gloves are helpful here). I like to leave a little space at the top of each roller but practice to get a shape you love, I think that’s the fun part! You’ll notice in these photos that I fold the bottom of my cones, but this is not necessary, it’s simply an aesthitic choice. If you’d like them more traditional just skip folding them and pinch the bottoms into a clean point. + For those looking for a more traditional size we’ll be adding a larger roller size to the shop in the next while. Join the list here. 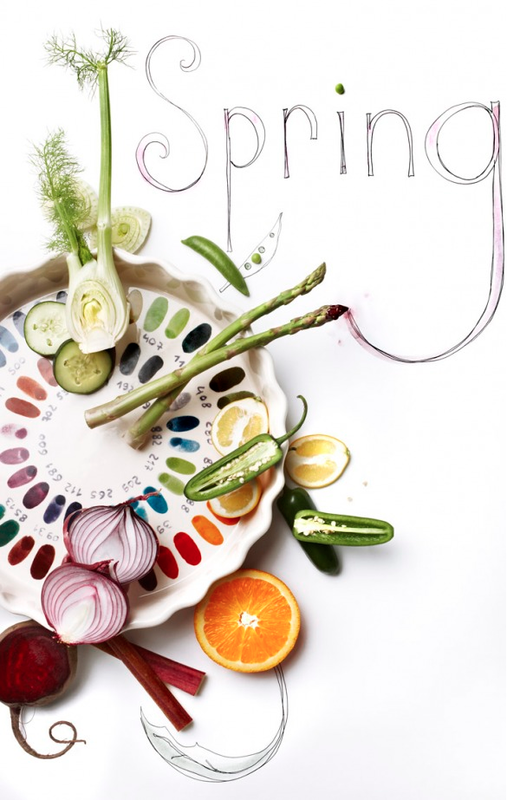 Wild asparagus omelette from My Greek Island Home by Claire Lloyd. This wild asparagus dish looks rather untidy, but it’s absolutely delicious. Put it on the table with a large spoon for people to help themselves. Bring a saucepan of water to the boil. Snap the woody bases from the asparagus and discard, then break the asparagus into pieces approximately 4 cm long. Drop the asparagus pieces into the water and boil for 2–3 minutes, until just tender, then remove from the water and drain in a colander. Heat a medium-sized non-stick frying pan over a high heat, add olive oil, then add the asparagus to the pan. Pour the eggs over the top and cook, uncovered, for 4–5 minutes until just set. Slide out on to a plate, scatter the crumbled fetta over the top, season with salt and pepper and serve. Cream of beans & cheese soup ~ always sounds sexier in french! Bring salted water to a boil, then soak the beans for 5 minutes. Take them out and put them in a bowl of cold water to stop cooking (beans are good and green). Remove their second skin, it is usually sufficient to “pinch” to bring out the bean (if using frozen beans, refer to the method of preparation on the package). Mix the beans with some broth, chopped chives, olive oil, a pinch of salt and a pinch of Espelette pepper (you can also add a clove of garlic). Add progressively to vegetable broth or water until desired consistency. Finally add the goat cheese and mix again. Reheat the soup and serve with a spoonful of goat cheese and some chopped chives.